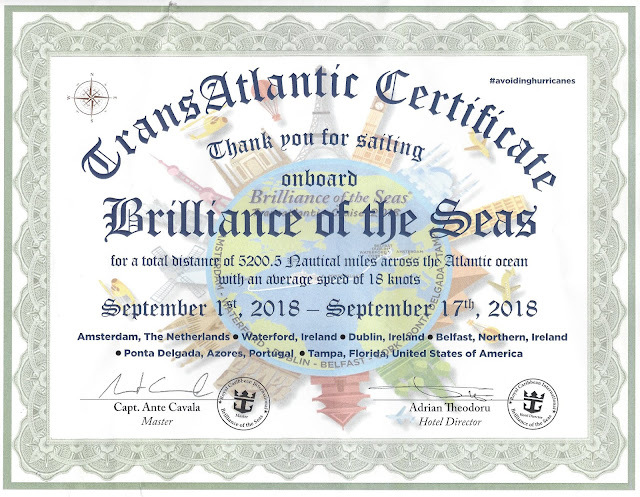 Ports: Waterford (Dunmore) Ireland - Dublin, Ireland - Belfast, Northeren Ireland - Cork (Cobh), Ireland - Ponta Delgata, Azores - and Tampa, Florida. We are in Amsterdam at the end of our European Adventure so no travel needed. I’m cruising with my Dear Wife (DW) and good cruise friends. 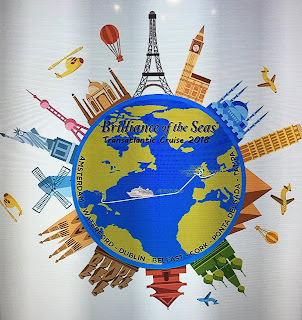 This is my first time on the Brilliance of the Seas, my 27th Royal Caribbean cruise, 7th Transatlantic, and 137th cruise overall. 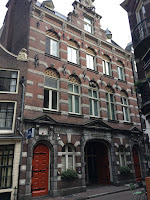 I slept well at our hotel in Amsterdam and enjoyed a nice Dutch breakfast, breads, cereals, cold meats & cheese, boiled eggs, jams & jellies, etc. about 9:30 this morning. Our group checked out at 11:00 am and we used an Uber (limo van as it turned out) ride to the cruise terminal (€14) arriving by 11:30. I need to begin using Uber when available. At the Cruise facility we proceeded through the check-in area, security, then customs control as we progressed to boarding the ship. We were offered a glass of champagne as we came aboard…very nice. We sat & visited in a Centrum lounge until they opened cabins at 1:00 pm. We then dropped carry-ons and up to the Windjammer for lunch. The Roast Beef on the carving station as usual on embarkation day was very good. Boat/ Safety Drill was held about 4:30 pm and following that our bags began to arrive at the cabin. We unpacked and it will be very nice to have the same cabin and bed for 16 days following our extensive European travels. DW and the GF’s went to the Diamond Lounge that took up all of the Colony Club lounge on deck six aft. It was really packed with guests. I stayed in the cabin and watched the opening game of my Oklahoma Sooners. They looked great for early season. I was beginning to feel a little weak and I think I got one of those common 24hr. bugs…so I skipped dinner and went to bed by 9:30 following the game. We did set our clocks back one hour for the first time of this voyage. It was an easy embarkation day on the Brilliance of the Seas. I slept fair and it was nice to sleep until 8:00 am. We will enjoy having no real schedule for the next 16 days. DW ordered Room Service which is her usual cruising morning ritual. I had her order some fruit for me and that was good as I didn’t feel like going to breakfast this morning. I rested until 1:00 pm then went to the Windjammer for some food...I tried to eat light. We then had to take our passports to Irish Customs to get a stamp to simplify tomorrows arrival. I enjoyed our balcony cabin and updated this review and checked other football scores. I took another long nap the rest of the afternoon/evening then about 8:00 pm I went up to the Windjammer for sirloin steak that is usually served on Royal Caribbeans first formal night…it was very good and I felt like Popeye eating his spinach…first steak this Texas boy has had in 18 days and I honestly began to immediately feel better. Really...so I had another, then one more small one. Still taking it easy so back to the cabin as we have an early excursion tomorrow but felt fine by bed time. Bug eliminated with rest. It was a very much needed restful day for me on the Brilliance of the Seas. Slept well and great weather clear and only in the high 60’s today. Our first port of call is Waterford, but we actually tender into Dunmore just east of Waterford. We have the Castles & Crystal tour booked so we went to the theater at 8:45 to meet group and we were soon off on Bus #9. The tour guide was Liam and he was a cracker. Full of knowledge and very entertaining. 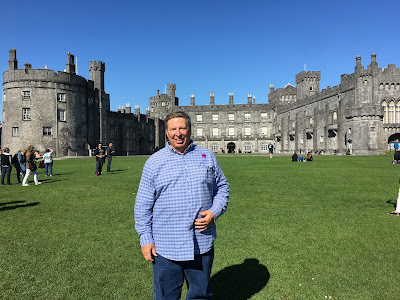 We drove 45+ minutes through beautiful country side to Kilkenny and our first stop Kilkenny Castle. The castle dates from 1195 and had been improved, sat in ruins twice, and improved again over the years. It is now owned by the local authority and has been wonderfully restored as a historical site and more for the town of Kilkenny. We then walked through the old town of Kilkenny on our way to our pub lunch at Langton’s Bar. Langton’s was an interesting place with both large modern dining facilities and an old fashioned small pub. Lunch was good, the choice was chicken or bacon, I took the bacon knowing it would be ham served with mashed potatoes and chopped broccoli. Dessert was choice of cheesecake or ice creme and I again made the better selection (luck this time) of ice creme as it was a huge slice of ice creme pie with several flavors and caramel and chocolate sauce on the side. I also had two halfs of the local beer Smithwick's Draught an Irish red ale. Very good beer and very nice pub lunch. We then drove to old Waterford town for our tour of the Waterford Crystal facility. DW actually remembered the stations and tour we took 30+ years ago, I had no recall of it at all. It was an interesting tour…as we went through the engraving department of the unique trophies they make I told them that they could go ahead and print the University of Oklahoma on the 2018 NCAA football championship trophy. The last piece of Waterford I purchased was a replica of the last one won by OU. We were returned to the ship about 4:40 pm towards the end of the tender run so no lines or waiting to return. A great excursion. The GF’s and neighbors on this cruise were sunning on their balcony on this beautiful day when we returned to the cabin. We all refreshened and went down to the Diamond lounge for some very nice cocktails. It was Cosmopolitan night for the group and I enjoyed several. Snacks were very good too. About 8:00 pm we went up to the Windjammer for dinner, the wonderful thing about it was that we ate outside in the wonderful weather and enjoyed a late sail away from the Irish coast. I love that option on the Radiance class ships. I retired as soon as I returned to the cabin. It was a great day in Ireland and on the Brilliance of the Seas. I slept well overnight and went to the MDR for breakfast for the first time this cruise. I ordered fresh fruit, Eggs Benedict, bacon, & potatoes…all very good. Another beautiful cool weather day in Ireland as we are docked in Dublin. About 10:00ish GF’s, DW & I shared a taxi from the port into Dublin City Center. We were dropped at the Spire and walked over to the GPO (General Post Office) the site of the 1916 Easter uprising that eventually led to Irish Independence. 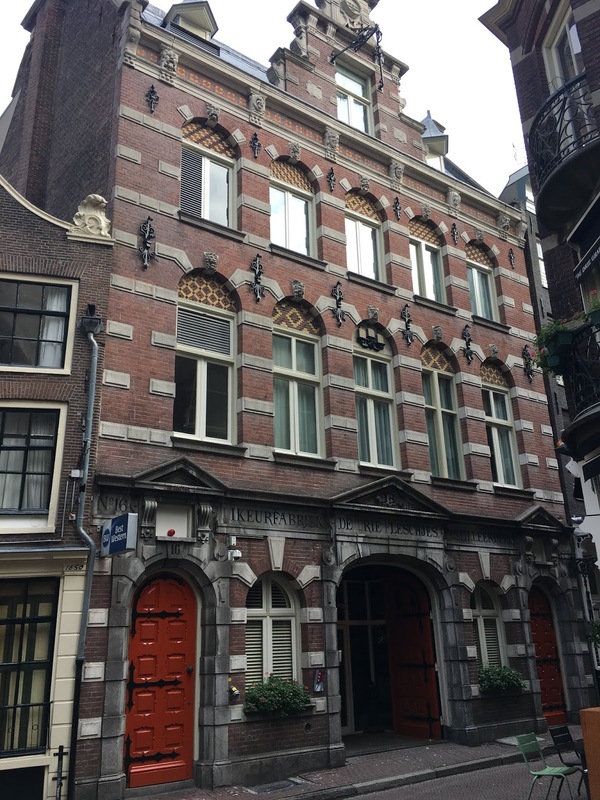 A beautiful building still used as a Post Office and now with a museum. 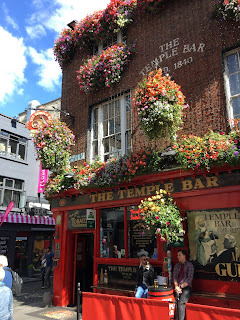 We walked down O'Connell street and across the O’Connell bridge to the old quay pedestrian area looking at quaint shoppes along the way until we reached the Temple Bar, Ireland's most legendary Pub/Bar. We enjoyed a round or two, enjoyed the live music, then ordered lunch. They offer a large assortment of sandwiches that were very nice. A very enjoyable couple of hours in a very unique public house bar. We then walked towards the high street passing the Molly Malone statue and visiting with a live Molly herself. We made it to Grafton Street the pedestrian shopping street and the ladies shopped a bit and guys listened to music as there were musicians every 100 feet or so. The musicians were a surprise to me. We walked all the way to St. Stevens Green and the Fusiliers Arch. We have covered a good deal of Dublin and decided we had best go easy as we have big excursion tomorrow...so we did an early return to the ship. Taxi back to port and in the cabin by 4:00. Easy day in port. R&R until we went to the Diamond Lounge about 6:30 pm for cocktails. Then up to the Windjammer about 8:15 pm for dinner. It was Italian night, but I had the minute steaks again. We again dined outside as we began our sail away from Dublin. I was a very nice day in Dublin and the Brilliance of the Seas. I slept very well and we used room service as a wake up call as we have an early excursion this morning. I had fruit plate and pastries from room service as we sailed into Belfast. Belfast will mean a change in currency today although there has been no mention of passport control entering into the UK from Ireland. We went down to the pier soon after we were cleared and found our small private group tour straightaway. We know there will be only 8, but once a half hour from arriving elapsed we were off with just 6 in a very nice van to stay ahead of the bus groups as planned and advertised. Our driver was Patrick and he was very good. 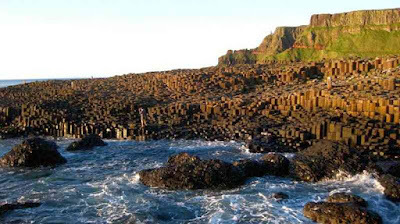 We did the 40 minute drive straight to the Giant’s Causeway World Heritage site and were among the first to arrive. After purchasing tickets we went straight to the site walking downhill and enjoying the views along the way. It is very interesting geological formation and as a geography major I did enjoy it very much. The basalt forms unique forms as it goes from the land formations into the sea. We rode the shuttle bus back up hill to the visitors center and enjoyed a snack in the cafe until the others arrived back. The center is run by The National Trust so it is a nice facility. We next went back through the town of Bushmill to the Bushmill Irish Whisky Distillery. We skipped the distilling tour and went straight to the tasting bar for a sampling of three Bushmill whiskies. (€8). Everyone felt pretty good once we left there. We called in our lunch order to a local pub in Ballintoy, the Fullerton Arms. It was a great place and I had the Guinness & Steak pie, DW a very nice salad, and I had a local beer. The place had memorabilia from the Game of Thrones including door no. 6 of a series of famous carved doors in Northern Ireland. From there we went to the National Trust’s Carrick-a-Rede Rope Bridge, an amazing location although we observed from the overlook. If we were staying in the area I would want to cross the unique rope bridge here. We then began the drive back to Belfast and Patrick took us to the Falls Road area the location of the ‘Troubles’ and current location of patriotic or memorial murals. They still close the gates each evening on the roads crossing from British side to the Irish side (not a Catholic/Protestant problem as most think, but British/Irish). I did not know that they still close these gates to this day. It was amazing to see this area first hand as I remember the troubles in 1969-72. We were returned to the ship about 3:00 pm for our 4:00 sail away. A great excursion and day. We skipped cocktails this evening and went to the buffet a bit earlier, not busy at all during the 7:00 pm hour. It was Spanish food night, but I stuck with my usual…the Steaks and the Pork Chops were nice tonight. We watched some BBC or ITV favorites on TV: Doc Martin and Poldark before retiring. It was a great day in Northern Ireland today. Just as it was for the ship Titanic, this will be our final port in Ireland before we begin the transatlantic portion of our sailing. I slept well and smooth seas overnight. I went down to the MDR for breakfast: Eggs Benedict with extras again. Very nice service in the MDR and nice visiting with other guests. We decided to stay in the nice historic seaside town of Cobh and not take the train to the city of Cork as original plan. The weather was cloudy but in 60’s so pleasant enough as we went into town about 10:30 am. We visited shoppes and waterfront on our way to the cathedral midway up the hill above the waterfront of Cobh. The Cathedral Church of St Colman, usually known as Cobh Cathedral, is a Roman Catholic church overlooking Cork harbour from a very prominent position. One of largest churches in Ireland in such a small town. Very impressive church from inside and out, loved the mosaic floor with the Celtic knots. The group wanted to continue up the hill, but I took refuge in the Mansworth’s Bar, one of the oldest in Cobh, and enjoyed a Coca-cola with Colleen. Soon I was joined by the others as there was really nothing more up on the crest of the hill. After a wee rest we did the other half of the waterfront shoppes, an interesting combination of businesses for locals and tourists. We stopped at the old White Star Line offices that has been converted into a Titanic Museum, Bar, & Restaurant. Lunch there was actually very good. I had a premium White Star hamburger and a White Star lager beer keeping with the theme. 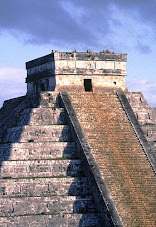 We took photos of the various monuments and visited with very friendly locals. I was first of our group to return to the ship about 3:15 but I had a nice five hour visit of Cobh. After R&R in the cabin we went to the Diamond lounge for cocktails…there was a Titanic theme tonight, it has been Irish past several nights, but the GF’s did order Irish whisky, I stuck with Cosmos. We went to the MDR for dinner tonight, first time for DW and I, this cruise. I ordered the Maryland Crab Cake, Spinach Ravioli as starter, French Onion soup, the Pork Tenderloin entree, and the Grand Marnier Souffle for dessert. Dinner was nice. We retired to the cabin after dinner. It was a nice day in Cobh and our farewell to Europe today. 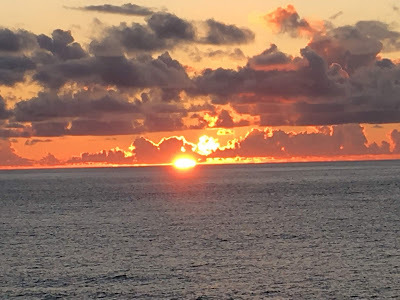 Now we are getting rolling seas overnight as we sail away from the coast, but I slept very well, I enjoy some rocking overnight. I went to the MDR for breakfast and ordered a ranch breakfast: 3 eggs over easy with ham, bacon, potatoes, and toast. Very good. 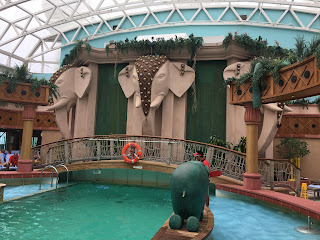 This is our first real sea day and we had not explored the ship so we did so…started on deck 13 Viking Crown Lounge and worked our way down walking all the public decks forward to aft. Nice ship, larger than last years TA ship Rhapsody, but smaller than the Voyager Class. Good size…we have never felt overcrowded although the Solarium was very busy with it too cool for main pool. By the time we reached deck 4 the Minstrel Dining Room just opened so we stopped in for a salad for lunch. They have the standard RCCL pick your own items/ingredients salad station set up on sea days in the MDR. DW left early to go to the Cinema we discovered on deck six for a 1:00pm movie. I stayed and had a nice Carrot Cake for dessert. I watched the highlights from the series Godless on Netflex and DW went to a second movie this afternoon. We purchased an excursion for Ponta Delgada, it’s getting difficult as we have been there many times. Cocktails in the Colony Club serving as the Diamond Lounge. Clavin from India has become our default server there. GF’s went to the MDR as they had Lamb tonight, we went to the Windjammer for dinner. It was Philippine night with adobo, popular with crew, but DW had a salad as usual and I again had the minute steaks. Something for everyone. Some BBC on TV before retiring. It was a busy day on the Brilliance of the Seas. Still cloudy skies and rolling seas but calming a little. We turned our time back an hour but I still slept until 6:00 am and then checked email. I went to the MDR for breakfast and ordered an Eggs Benedict + extras, all very good. DW went to exercise and I had a lazy morning then went up to the Lido deck to enjoy the sea breezes before I settle in for NCAA football this afternoon and evening. I had lunch in the Windjammer a nice pub lunch style Steak & Vegetable concoction that I put on mashed potatoes. I watched ESPN’s College Game Day then the Oklahoma vs. UCLA football game. The cabin was stocked with coca-cola and game snacks to make an afternoon of it…always fun when your team wins. DW saw several movies today and usual cocktails with the GF’s. I was content with NCAA football. After the game I had time to go to the Windjammer before it closed. It was Chinese night and I did have some in addition to my minute steaks. The late football games won’t be on until midnight local time so I will pass since we have an early excursion in Ponta Delgata. 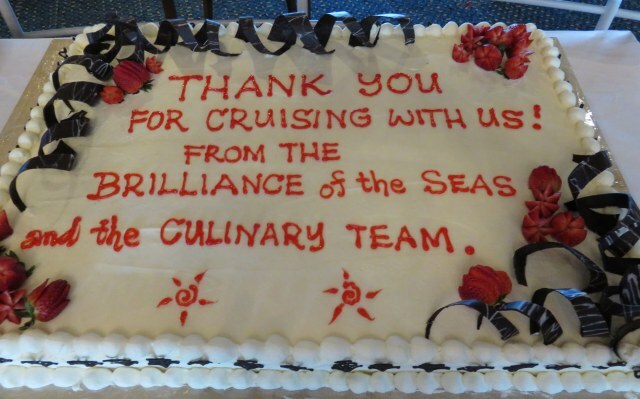 It was a fun day on the Brilliance of the Seas. I slept well and the room service call was our wake up for this morning. After breakfast we met for our Furnas Valley tour at 8:30 am. We have been to Ponta Delgata many times and this was a NEW tour just added, it wasn’t online nor on our excursion booklet in the cabin, so we booked it at a fair price ($40pp). It may be a trial but new tour locations are needed here and we are taking advantage of it. 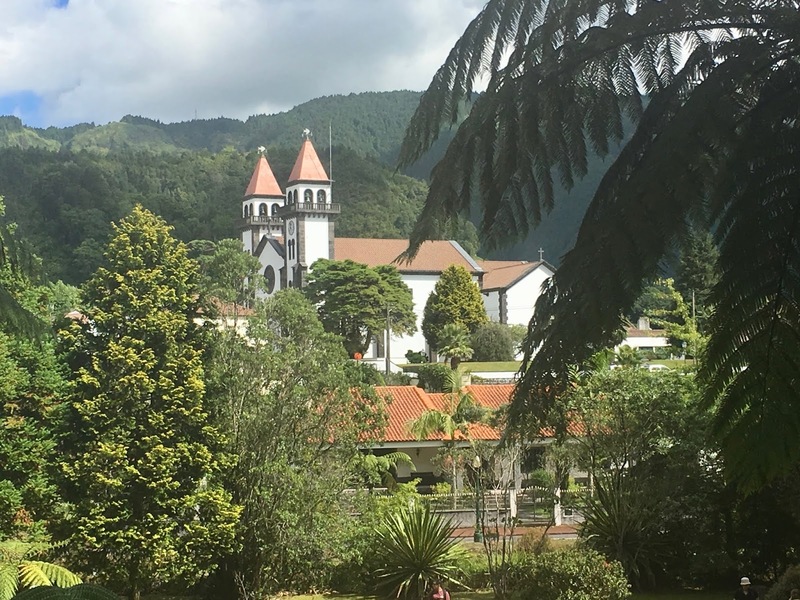 We were off in our bus before 9:00 am and drove to Ribeira Grande an old town located on the north coastline of São Miguel island. We saw the Church of Nossa Senhora da Estrela, then had our first (and only) pastel de nata of the day (they were great). Next stop was a viewpoint over the Lagoa do Fogo and the Furnas Valley. You could see smoke from many thermal springs and the beautiful lake below in the old caldron of a former volcano. Next we had a tour of Parque Terra Nostra. This is a lovely park with extensive gardens and thermal springs with pool, but although the temperature is only in the low 80’s the humidity is about 90% so most of the old timers on the tour were moving slowly by the time we left here. Our next stop was in an area of Furnas where they had numerous bubbling (boiling) hot springs. Amazing, you would think you were in Yellowstone, but your actually in a an old city. They are found throughout the Furnas Valley in rural areas or parks, but to see them in a city is very different. This was the last stop and all were ready to board the air-conditioned bus by the time all viewed the hot springs. From the bus we saw some beautiful views from mountains to coastline but were happy to arrive back at the ship about 2:00 pm. Windjammer for all of us as we had worked up an appetite...then to cabin to cool and rest. DW went to a 4:00 pm movie and we all met in the pub on deck 6 forward about 5:30. First visit and we used the Diamond benefits on our cards to get beer, wine, or cocktails. A great system for benefits and to get members out to other bars. We then went back to the Colony Club for more cocktails and eventually to Windjammer before it closed for some late night snacks and more. They were making fancy desserts involving a waffle iron that the ladies enjoyed. It was a enjoyable and different day in Port Delgata and on the Brilliance of the Seas. Still a bit of rolling seas and I again slept very well. We turned our clocks back an hour and the weather is very nice and warming for us. I went to the MDR and ordered the Eggs Benedict + extras, also hot milk. A relaxing breakfast and always an opportunity to visit with guests. 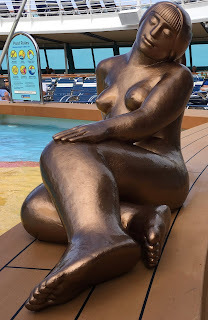 I then enjoyed the best balcony weather of the cruise so far to update blog and check scores. DW and I walked up to the walking track on deck twelve, 6 laps = a mile, I did two she did her mile. Breezy but sunny on deck and guests are in the pool today. We went to the Windjammer for salad, having a light lunch today. Slow afternoon for us, mostly cabin time…unfortunately we were without internet all afternoon and evening…bummer. Guests have complained about a lack of American news (no CNN or FOX) and our current weather situation…so the CD and Captain had a special weather report that played most of the day on cabin TV. I believe we will be lucky and slip between the two hurricanes currently heading towards the U.S. We did go to the Diamond Lounge early as DW and GF’s were going to the show tonight. The theme in the lounge was Cheers, first time it was not a country or nautical theme, it has been decorated each night. We enjoyed our cocktails and the group enjoyed the production show: Tango Buenos Aires in the theater…so much that DW attended the second show as well. It was Japanese food among all the other selections in the Windjammer; however, the popular item was fresh hot Crepes for dessert. I guess I’ve eaten all the minute steaks, none the past two nights so I had two nice Pork Chops with potatoes and vegetables. It was a nice outdoor weather day on the Brilliance of the Seas. Smoother seas overnight and I again slept well. The weather is overcast, but still warmer than the Irish Seas. I went upstairs for breakfast in the Windjammer for the first time this cruise. As I suspected they seemed to have everything: ham on carving station, bacon (rashers), English bacon, sausage, omelette station, lots of breads, lots of fruit, cereals, oatmeal, and much more. I even got a hot milk. By far the primary option for guests breakfast on board the Brilliance of the Seas. Still no internet in the cabin this morning, but surprise we now have FOX news. I think the combination of the hurricane hitting the U.S. and no internet forced RCCL to allow some news programs. 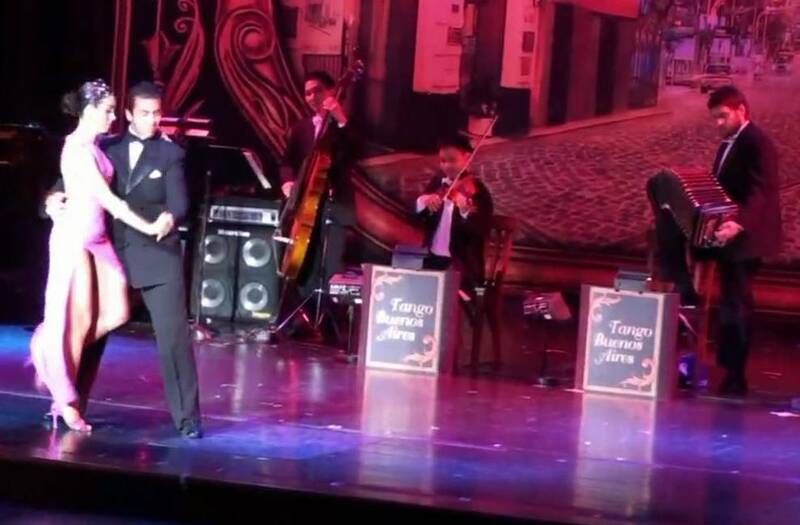 The DW wanted me to remind everyone that the Tango Buenos Aires production show is a must see show if you have the opportunity to see it on a Royal Caribbean Ship, evidently this show is being moved to a larger ship. At noon they held a 9/11 remembrance and veterans gathering in the Centrum with cake and mimosas, it was well attended. About noon I went down to deck 6 and had internet, then by late afternoon it was working in the cabin…just a part of sailing on a transatlantic cruise. They had Reuben Sandwiches in the Windjammer for lunch today. The weather worsened as we are still avoiding the three hurricanes, a bit wet and rocky seas. The Windjammer exceeded expectations again tonight. At first carving station they had two types of ham, but I knew to look further and at the other station they had Prime Rib, tender & moist prime rib with horseradish. Amazing and delicious. They also had Osso Bucco and very nice pork chops among other things. So many choices. We’re turning in early tonight since it was rolling seas and raining. It was a nice changing weather day on the Brilliance of the Seas. Rolling seas overnight and I again slept very well. The weather was better and warmer than previous day. Still avoiding three hurricanes and two tropical storms. We set our time back once again last night and are now only two hours off EST. I went upstairs for breakfast in the Windjammer for the first time. As I suspected they seemed to have everything: ham on carving station, bacon (rashers), English bacon, sausage, omelette station, lots of bread, lots of fruit, cereals, oatmeal, and more. I even got a hot milk. By far the primary option for breakfast on board the Brilliance of the Seas. Still no internet in the cabin this morning, but surprise we now have FOX news. I think the combination of the hurricane hitting the U.S. and no internet forced RCCL to supply some news programs. The DW wanted me to remind everyone that the Tango Buenos Aires production show is a must see show if you have the opportunity to see it on a Royal Caribbean Ship, evidently it’s being moved to a larger ship. At noon they held a 9/11 Remembrance and veterans gathering in he Centrum with cake and mimosas, it was well attended. I went down to deck 6 and had internet, then by late afternoon it was working in the cabin…just a part of sailing on a transatlantic cruise. They had Reuben Sandwiches in the Windjammer for lunch today. The weather worsened as we’re still avoiding the three hurricanes, a bit wet and rocky. The Windjammer excited expectations again tonight. At first carving station they had two types of ham, but I knew to look and the other station and they had Prime Rib, tender & moist prime rib with horseradish. Amazing and delish. They also had Osso Bucco and very nice pork chops. So many nice things. We’re turning in early since it was rolling seas and raining. It was a nice day on the Brilliance of the Seas. Rolling seas overnight and I again slept very well. The weather was better and warmer than yesterday. We set our time back once again last night and are now only two hours off EST. I went to the MDR for breakfast ordering fried eggs to order…they were close to correct. Hot milk, bacon, potatoes, and fruit were good. Lazy day today, DW did some movies, I did some Bosque Travel work. They had pork ribs at lunch, unique, but not near as good as what NCL does with their pool deck BBQ. I did have some nice balcony time in the afternoon. The ship does offer a lot of activities during the day: lectures, music, movies, trivia, and games…today they had an Amazing Race. For a change we went up to the Viking Crown Lounge on deck 13 for cocktails. You do have a nice view, first a bit sunny, but then rewarded with great sun set. We enjoyed it as we had to make a dash to the Windjammer arriving just before it closed at 9:00 pm. It was Cake night…a vast selection of cakes at the dessert station. As it was closing they cut huge pieces for you to enjoy. It was a long and lazy day on the Brilliance of the Seas. Again rolling seas overnight and pretty dramatic, you would really roll from side to side in the bed but I slept surprisingly well. Clear skies and the Captain has done a great job of sailing between the four hurricane/tropical storms and keeping us safe. This morning I went up to the Windjammer for breakfast. The pancakes and poached eggs were wonderful. Another sea day and pretty much the same same as other sea days. We have TV, food, internet, and various activities to occupy our time. Cocktails in the Lounge and Windjammer for dinner. Various ship activities in the evening or cabin time. Another long and lazy day on the Brilliance of the Seas. Again rolling seas overnight but smoother and I slept well. Again this morning I went up to the Windjammer for breakfast. Only fresh pancakes and bacon this morning. Another sea day and pretty much the same same as other sea days. We have TV, food, internet, and various activities to occupy our time. Cocktails in the Lounge and Windjammer for dinner. Various ship activities in the evening or cabin time. Another long and lazy day on the Brilliance of the Seas. Fair seas overnight and I slept very well. I went up to the Windjammer for a nice early breakfast. It’s a college football Saturday so I streamed and watched College Game Day that was broadcasting from the TCU campus in Fort Worth today. Oklahoma has had three early kickoffs in three weeks that have actually worked well for me since I’m so far later in the day in time zones…today only two hours difference for kickoff at 1:00 pm Atlantic Time. The game streamed well in my cabin so I enjoyed the afternoon especially since my team won. DW did a movie and other activities. I watched some other streamed games as well until the late feature games were on the cabin/ship television. I was wearing my TCU hat today and I actually saw a couple decked out in TCU colors when I sneaked out for a snack. It was really nice seeing land today as we sailed through the Bahamian Islands this afternoon. DW and GF’s did cocktails and the second featured Production show: Center Stage. It was also the farewell show so she also thanked the Captain for avoiding all the hurricanes and tropical storms this cruise. 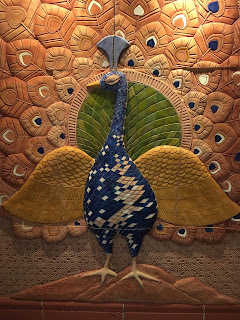 Something happened that has not happened in my 137 cruises…DW ate dinner in the MDR more times than I did on this cruise. That doesn't happen as she's not a MDr fan. I was curious if the Windjammer had anything unique as this was the third and final ‘formal dinner’ night. They did had Leg of Lamb and I mean huge pieces of meat. Not my choice but I did have the Peach Flambé featured dessert. I enjoyed my day of college football on the Brilliance of the Sea. Smoothest seas of cruise and we were docked very early in Tampa. I slept very well. We had some snacks for breakfast as we finalize packing this morning. We said good bye to the GF’s and did leave the cabin about 8:15 for the Lido deck as we have very high debark numbers. The good news is that the Windjammer was somewhat still open so I had scrambled eggs and bacon…nice. Then enjoyed internet time for an hour +. Trying to be the last off is much more relaxing than dealing with the crowds. And the DD, our pickup ride, has it easier as well. We were at our hotel, Crowne Plaza-Westshore about noon and they both allowed an early check-in and we were upgraded to a nice suite. Sweet. After we settled in we drove back to Ybor City area and had a long lunch at the renowned Columbia Restaurant an icon since 1905. We then looked at the renewal of the Ybor area with many of the old Cigar factories repurposed into condos, trendy bars, restaurants, and more. For future reference I noticed that two new hotels would be very close to the cruise port. Tuesday will be our air travel day back to Texas. An end to a long journey through Europe and transatlantic cruise. We had cabin 7556 a balcony cabin located between the Atrium and forward elevators on deck seven on the starboard side. The room is the standard size for a balcony. It has the following: key pad safe, hair dryer, small couch, vanity/desk, small standard shower, storage in cabinets and vanity, flat screen TV, and good lighting. Well designed. The air conditioning & water pressure worked well. Excellent service from cabin steward Marcina. You will hear music from somewhere (maybe Pub) on rare occasion in evenings, but not late at night. All service people have been excellent, they have an obvious ‘guest first’ attitude and it shows in service and attitude. My favorite was Clavin from Goa who served us in the Diamond lounge most nights. Overall very good food. Excellent: Cookies, Ice Creme, Breads, Rice, Mashed Potatoes and special entrees in Windjammer. Amazing that the Windjammer dinners were equal to or certainly more varied than the MDR. Unique items in Windjammer: Mongolian Grill, Mussels, Minute Steaks, Gyros, Leg of Lamb, Spanakopita, Crepes, Cake Night, special garlic bread every night, special salads and ingredients, and much more. The Diamond Lounges were always busy but adequate number of bar servers for number of guests. We really enjoyed the first days of doing very little and relaxing after a busy seventeen days touring Europe. Got busy doing Ireland for four days, then relaxing balance of cruise. The Windjammer food was excellent, really exceptional. It was a needed relaxing cruise. 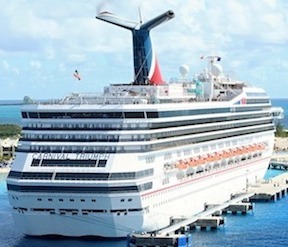 Welcome to my collection of cruise reviews. I am an avid cruiser, an admitted foodie, and a contrarian cruiser, not always following the 'typical' flow or schedule of most passengers. Perhaps you may pick up some tips or ideas from my previous experiences. Enjoy.